Government agencies are second only to Education in ransomware attacks (2016 BitSight Insights Report). What are your ex-employees walking away with? Keep tabs on your IT asset lifecycles from onboarding to offboarding. Windows 10 offers multiple benefits, but comes with many challenges. Learn how best to make the move and keep it up-to-date. Is Your IT Modern Enough for Government Work? Deliver more and better services to your citizens. Protect and secure constituent data. Catch and punish cybercriminals. Consolidate. Innovate. And do it all while cutting costs and maximizing the value of your IT assets. Chances are you may be facing a security, automation, or cost cutting challenge right now – or maybe all of them. But to address any of them in state and local government, you need to do one thing: modernize your IT. You can’t deliver services effectively, efficiently, and securely, or comply with evolving regulations and best practices, with yesterday’s technologies. You’ve got to move to more modern IT—without breaking budgets or business processes. Enhancing citizen services when you don’t know how your IT services and assets are performing is difficult. Multiple point products makes device management difficult to learn, and inefficient to use. Microsoft's rapid release cadence pressures IT to constantly update or run the risk of being vulnerable and out of compliance. Ever-changing complex vendor licensing structures creates barriers to get and stay compliant. Where are your critical hardware and software assets? They may be on the move and disconnected. Private sector compensation levels can make finding and keeping security talent in the public sector difficult. Cyber criminals would love to get their hands on citizen data and other sensitive information governments manage. Whatever your IT management challenges, Ivanti can help. Ivanti solutions can help you improve asset management, deliver more effective security, implement Windows 10 with minimal disruption, and modernize your entire IT infrastructure. And Ivanti Professional Services can combine our innovative solutions with deep experience, to help you make all the right moves. Protects against even sophisticated threats. See and manage all your most critical IT assets across their entire lifecycles. Manage all of your devices from a single solution. With one click, apply policies and software to user and their devices. 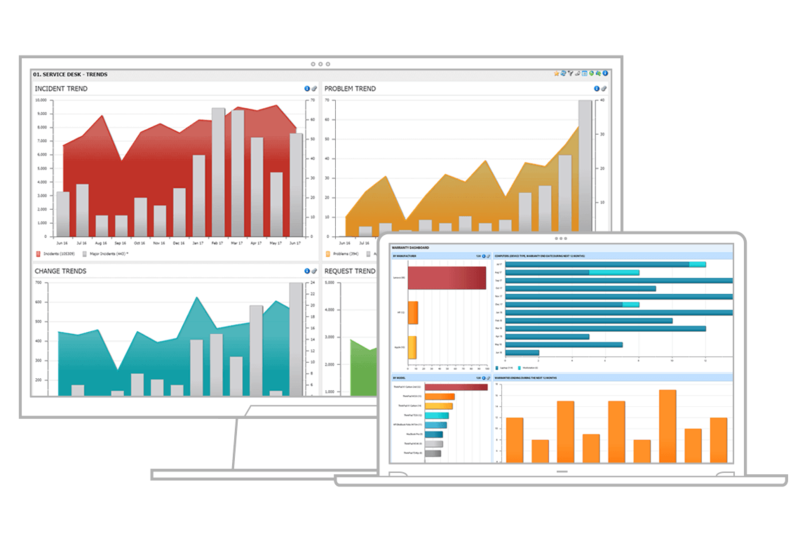 Create dashboards and share insights of all your essential IT data in real time—no IT skills required. Your IT environment is critical to your organization’s success and its compliance with vendor regulations. Ivanti solutions and services provide the benefits you need to modernize, manage, and secure that environment, today and tomorrow. 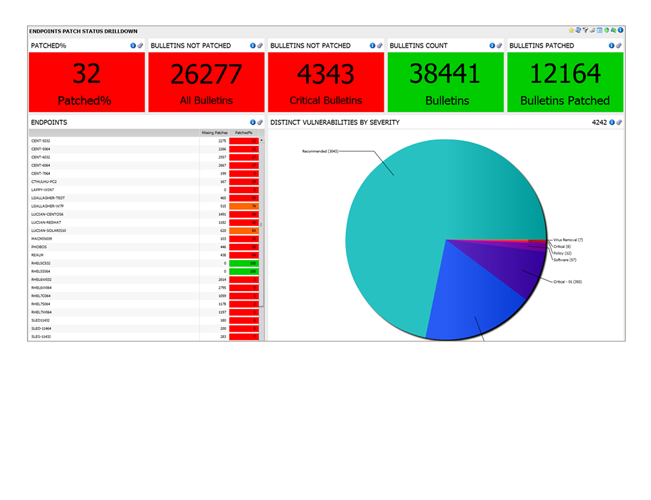 Self-service IT reporting dashboard and analytics in real-time. Unify your critical IT data in one place with pre-built connectors. Get the right information to the right people to act faster. Seamlessly migrate users’ profile and data to Windows 10, and achieve a continuous state of migration and harmony. Complete visibility to maximize the performance and value of your hardware and software. Gain the ability to reclaim unused software, meet compliance requirements, and save time with a centralized view of your assets. Automate discovery, patch management, and application and device control. You can even isolate infected devices and take action swiftly to keep running malware from spreading.